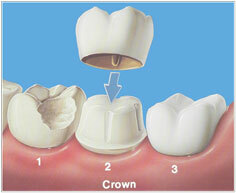 Porcelain bonded to metal crowns: this is most commonly used. A precious metal base is made and layers of porcelain are then applied over it. If you have any questions about our Crown Dental Services, give Dr. Majeed’s Office a call or simply fill in the form below for a quick response.